This is the first of SEVEN "Finds" books by the ever popular Gordon Bailey, and contains over 1,000 illustrations. 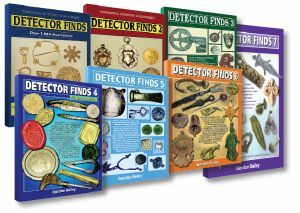 It is designed to help metal detectorists identify finds. The contents of this volume cover Buckles, Clog & Shoe Clasps, Buttons, Hook Fasteners, Gun Money, Crotal and Rumbler Bells, Love Tokens, Ring Brooches, Lead Artefacts, Hawking Bells and Whistles, Pipe Tampers, Candle Snuffers, Hasps and Clasps, Copper Nails, Horse Decorations, Pomanders, Spurs and Pastry Jiggers.